You finally have decided to quit smoking and are finding it real hard to stick to the decision. No worries! Just take a good look at your kitchen and you will find a large storehouse of nutritionally-rich foods that can help you curb that craving on time. Cinnamon: Cinnamon mimics the feeling of smoking. 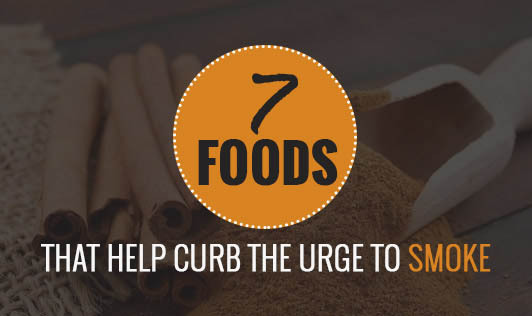 Holding a cinnamon stick to your mouth (like a cigarette) or chewing on a small piece of cinnamon gives you a feeling similar to the one you get while smoking or chewing tobacco. Ginger: Chew on a piece of diced ginger and its pungent flavor will definitely leave an aftertaste in your mouth that offsets the after taste of a cigarette or tobacco chew. Additionally, ginger cures nausea, one of the major withdrawal symptoms experienced by smokers. Raisins & Dried Nuts: Munch raisins, cashew-nuts, almonds and pistachios especially when you are about to give in to the urge of smoking. Nuts are alkaline which helps in controlling the craving for nicotine. Fresh Juice: Instead of stopping at the smoker’s lounge, move on to a juice shop and treat yourself with a dose of fresh juice. Juice keeps the body hydrated, helps fight dryness in the mouth, and eases withdrawal symptoms. Milk: Believe it or not, this wholesome food helps curb the desire to smoke too! Just have a cup of milk before your normal smoking time and see for yourself how bad it tastes when you give in to the craving for a smoke. Fibrous Vegetables & Vitamin C-Rich Fruits: Cauliflower, cabbage, broccoli, oranges, berries, guavas, and celery are some of the foods that can help you when you quit smoking. These vegetables provide you with more scope for chewing, a simple activity that is found to be effective in fighting the urge to smoke. Cloves: Cloves too like cinnamon mimic the effect of nicotine. When you chew on a clove, it leaves a taste similar to nicotine in the mouth. This reduces the urge for smoking. Water holds one of the most respectable spots among the list of foods that help fight urge to smoke. Keeping the body hydrated is also very important when you are in the nicotine withdrawal phase. So, drink lots of herbal teas, juices, and definitely water to enjoy your new phase.